When thinking of startups you usually don’t think of stars, satellites and spacesuits. However, spacetech can be used by promising entrepreneurs to explore new applications for life on Earth. That’s where the European Space Agency (ESA) comes in. I decided to have a look in Noordwijk – the Dutch centre of ESA’s pan-European network – to discover how startups will aim for the moon. The ESA business incubation centre (BIC) network consists of 11 locations through Europe, with Sweden and Prague coming soon. They all focus on spin-off companies from ESA’s space technology. So when I went to visit ESA BIC Noordwijk I actually was pretty nervous, simply because I didn’t know what to expect from a spacetech incubator. People in labcoats? A sterile and quiet environment? Super serious (old) scientist? I mean, come on, we’re talking about ESA here (or as I told my friends – ‘the European NASA’). They get people into fricking space. The first thing I noticed about the building is when I walked towards it. Here in Noordwijk, in the middle of a remote industrial area, a rather playful half oval structure popped up. It was not too small, not too big. I immediately thought of it as ‘sympathetic’. After seeing pictures of all the other ESA BIC’s, this building was even more impressive. When I walked inside, a huge satellite immediately caught my eye, standing near enormous daylight admitting windows in the back. How’s that for a first impression? While I met community manager Martijn Leinweber and Natascha de Waal (marcom), I simply couldn’t get my eyes of that solar beauty. While walking throughout the building, Leinweber told me about the startups here. They usually stay for a year or two, clearly indicating the businesses here are in it for the long run. No 3-month programme to rush things – science takes more than just a business model canvas, a MVP and a first customer. Have in mind the startups are applying those expensive space technology to improve life on earth, and you see why you need some time to adjust. First stop is a working space, best described as a room filled with machines and tools like in ‘shop class’ in high school (or ‘Technics’ in The Netherlands). No science guys in coats, just some people working on their prototypes. It describes the laid back, helpful and at the same time ‘can do’ mentality here. Something that’s being stimulated: older startups are mentors to younger ones, like a teacher and his apprentice. Next where some highlights of companies that really made spacetech stand out. 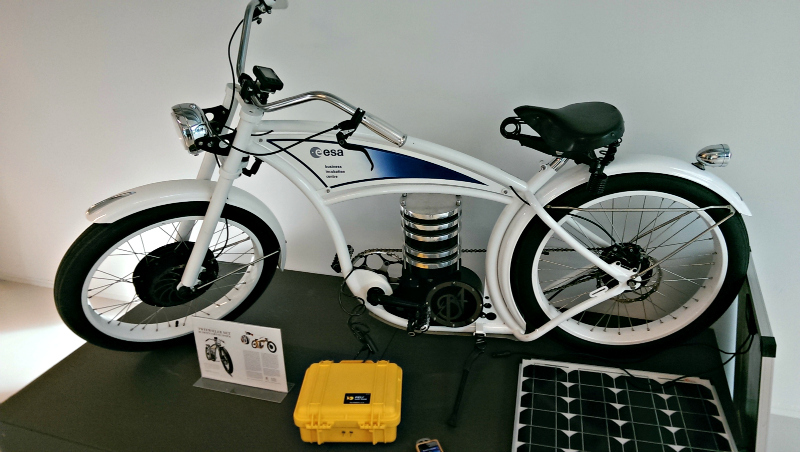 For instance the B4 Cruizer, an e-bike with a battery made from technology normally used in outer space. One particular project really impressed me. Lens R&D used sunsensors from the solar panels on satellites for solar parks on earth. A nice spin-off, sure. But the entrepreneurs even made the tech better, and more important for use in space, lighter. 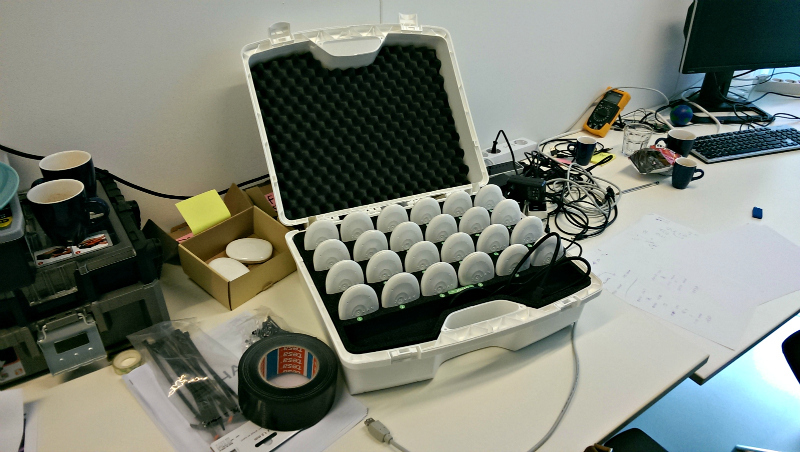 Guess which sensors ESA uses now in space. This way Lens R&D became a spin-off as well as a so called spin-in. The company recently won the Shell Livewire Rising Star Award. During the day I talked to three startups. Johan Sports (an obvious hint to Johan Cruyff) use spacetech in a motion tracking physical performance meter for sports teams. The youngsters of this startup already have professional football clubs like De Graafschap and FC Volendam as their clients. The startup is also talking with Metrica Sports, the Amsterdam-based startup measuring sports tactics. Two other startups I spoke mainly used spacetech to improve location-based services (yay satellites!). Social Charging shows nearby chargers for EV’s and let people know when other cars are fully charged, also sending a message to the car owner. This way chargers are used more efficiently. Knowble uses space location tech to learn languages more efficiently as well: with location in mind, the startup offers sentences or words based on context: for instance: when you’re in a supermarket you don’t need to learn words about travelling, but about food. Also, an algorithm decides the best way a learner is picking up the language, creating a personalized ‘newspaper’ of articles to learn the language with. Next to all the amazing high tech stuff that happens here, seeing applications for everyday use really thought me there’s more than meets the eye. 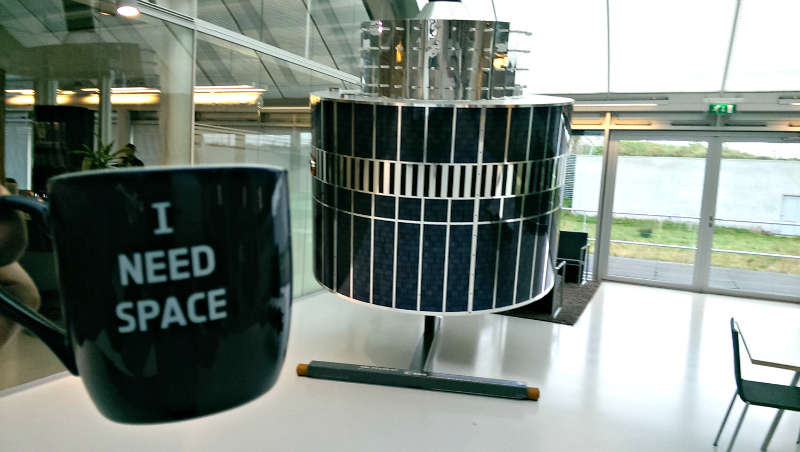 Even ESA’s mugs scream ‘fun’ with the text ‘I need space’. All of this make ESA BIC Noordwijk a casual place where people are serious about space. So I can honestly say, for a spacetech incubator, they’re pretty down to earth.